On January 8th, 1912, the business and property owners of the San Diego Common Council passed Ordinance No. 4623. The function of the ordinance: to criminalize free speech in a zone centered around the intersection of 5th and E streets, populated primarily by workers. By January 16th, the IWW had responded by forming the “California Free Speech League,” with the support of socialists, churches, and other union locals. The Wobblies, with the benefit of sheer numbers and little else, sought to test the ordinance and its enforcement with aggressive soapboxing and incessant speechifying in the restricted zone. City attorney W. R. Andrews recommended against enforcing the ordinance until February 8th, to stave off immediate confrontation with militant agitators in the Gaslamp Quarter. When police intervention began, the jails were quickly filled, and the IWW put out a call for members to hurry to San Diego County for more support. What does it mean to commemorate the question of “free speech” one hundred years later? An affirmative history of these events forces us to recall that what began as a mere reformist gesture, a simple collective act of civil disobedience, ultimately threatened bourgeois society and brought its order to the limit. The IWW had practiced direct action and movement-building in one arch-strategic sequence of rupture and alliance. The fact that this movement was initiated by a reformist campaign is of fundamental significance. The IWW demonstrated that rallying around these kinds of issues can prove to be very powerful; their actions were understood as steps on the path towards the development of revolution. The actions of the original rank-and-file of the IWW require us to rethink the difference between calls for reform and the explosion of purely insurrectionary acts. We can determine how the Wobblies performed a political process at a distance from the state, while traversing the facile opposition between tactics of direct action and the hard work of community organizing. Political class composition is above all the result, the end point of a historical process. But it is also, and in a dialectical manner, the starting point of a historical movement in which the labour subsumed to capital interprets the productive, social and political organisation of exploitation and overturns it into the organisation of its own autonomy. This means that organizations emerge out of historical processes; they are situated in specific configurations of the labor process and social development. With this in mind, what value does the original IWW still have for us given our radically changed historical conditions? One tradition of the left obsessively studies labor history, only to return to the same tropes, the same scenarios, the same tired schematics time and time again. Conversely, a countercurrent dismisses any affirmation of a history of struggle, which could be carried forth in the sense of lineage – as though the new could be railroaded into being, armed with nothing more than desire and obtuseness. To traverse both tendencies requires that we recognize, even celebrate, past victories and conflicts, but also engage in the cancellation or subtraction of elements that are immaterial to a situation. Commemorated endlessly by labor historians, the raucous events of 1912 find themselves subject to the academic separation of labor history and labor struggles. Against this trend, we approach the Free Speech Fights less as sanctified “radical history” and more as a genuine map of where militancy, organization, and politics meet; not as a programmatic prescription, but rather an invitation to think contradiction. We are opposed to the existing order; we are against it from bottom up. We do not respect the laws or flag of the United States. It is a symbol of oppression… It floats over the vilest places and has no message for us. We do not believe in the system of wages. We propose to overthrow the whole system and give every man a chance. We do not believe in a God. The preaching of the gospel of Jesus Christ has been the greatest curse in the world because it preaches submission to the present order, promising something better in a future life. This insurrectionary rhetoric served to frighten, not seduce the middle class. The refusal to meet niceties of political discourse halfway was redoubled in the street – all the while circling around the “reformist” issue of free speech. But insurrectionary rhetoric was bridged with the strategy of “accompanying” people in their demands for a better life. Millennialism and a “coming insurrection” would be seen as “pie-in-the-sky” talk, no more useful than the obnoxious ascetism that found virtue in poverty. Instead, Wobblies emphasized material gain for people who were hungry, ill-housed or undereducated: “Porkchops for all!” was one such great materialist slogan. Remembering the Free Speech Fights is less a matter of getting the facts right, than resurrecting the spirit such past militancy inspired. What is important to recognize are the formal properties of the original IWW as a union, which refused to distance itself from the working class of San Diego as a subject. The rank and file could identify themselves not just with the union, but as San Diego’s working class as a whole. In struggle, their class autonomy differentiated itself not only from capital and the state, but from specific trades as well. This was a body of persons who toiled in undesirable jobs by day and discussed Marx by night. This was a union that assigned roles to its most enthusiastic, while lacking the means to enforce members to pay their dues or participate at all if they did not desire to do so. 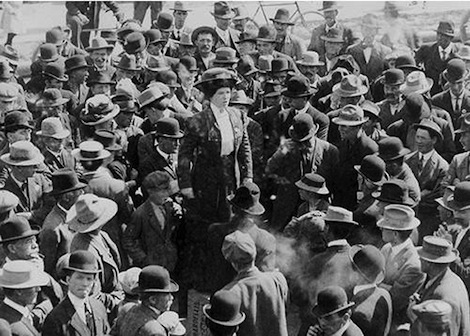 The San Diego Wobblies had anticipated popular support for fighting the local ordinance. The use of reform brought them into relation with the working class outside their union; it overturned the political and organizational limits of syndicalism. By performatively soapboxing and getting arrested, their struggle was no longer mediated through capital’s exploitation of their labor power. This strategic appraisal of their situation was consistent with the historical traits of the original Wobblies as a radical organization of militants and workers. While the IWW promoted “Agitation, Education, and Organization,” it hosted numerous unemployed and homeless in its ranks. There was no esteem for the anarcho-individualist fetish of “illegalism,” only a recognition that what was illegal was often necessary for people of no means. The structure of IWW held the capacity for leadership, heroism and individual recognition; there was no time for obfuscation or anti-social behavior. Lucy Parsons, Big Bill Haywood, Joe Hill, Helen Keller, and Elizabeth Flynn all stand out as individuals who did not equivocate their support for the struggles of the working poor, revolution, and outright class warfare. However, the horizontal organization of their struggles provided numbers for anonymity, magnitude, mob, rally, and riot. Trevor Owen Jones is a librarian and a writer.